Your organization is filled with Requesters and Fulfillers: everyone is either requesting services from others, or providing services to others, or both; that’s how business gets done. But it doesn’t get done well with email, phone and paper service request and fulfillment anymore, and a modern competitor will run circles around you. Modern Service Management centralizes and streamlines service delivery of all kinds, and we have compelling Service Management solutions in Quick Base. Download Universal Service Desk data sheet. We can quickly help you serve your company’s customers and employees better with best-practice Service Management solutions: ESS (Employee Self-Service) Portals, Customer Service Portals, based on principles of ITSM, ITIL, and more. ServiceNow® as the leader in ITSM? Yes! We're certified in ServiceNow as well, and bring those best practices to you in Quick Base. Intelligent, multi-function Service Portals in Quick Base. Multi-function Portal with Service Catalog added for ordering. Use technology to make it easy for customers to do business with you, and employees to do their work. A Service Management mindset cuts across functions and boundaries and just serve the customer...they don’t care about silos, so our cross-functional, mobile-enabled portals don’t either. Deliver end-to-end customer service, regardless of the groupthey need help from, making Customer Service a Team Sport. 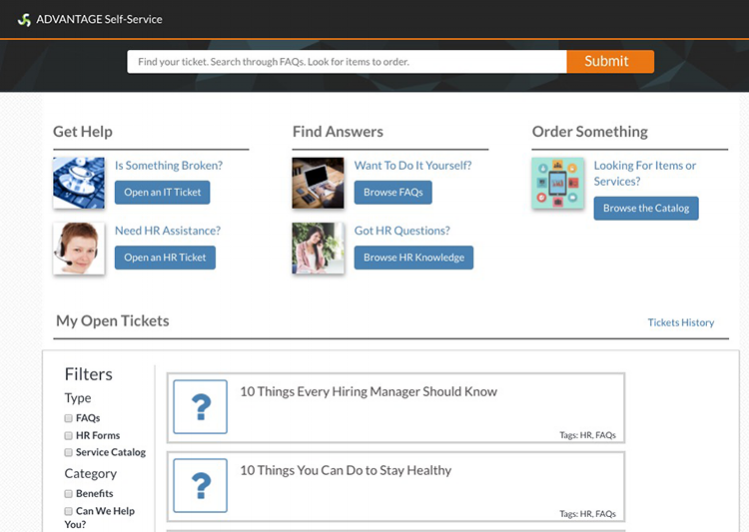 Provide a high level of self-service, and a single portal resource. Route cases effectively and manage them better centrally. Automate business form and document digitizing, for Digital Transaction Management (DTM). We have it all, and you can do it in Quick Base.